In February 1970, a group of soil and foundation engineers from Southern California met to discuss the status of the profession, and to assess if there was a need to form an organization to represent the unique needs of California’s private-practice geotechnical engineering consultants. In May 1971, the Soil and Foundation Engineers Association (SAFEA) was established with a goal unlike other engineering associations: Rather than focus only on technical research and social events, SAFEA would address the key business and legislative issues necessary to advance the profession of private-practice geotechnical engineering. That mission remains just as strong today, as decades later the organization has grown to serve thousands of geotechnical engineering consultants across the Golden State. 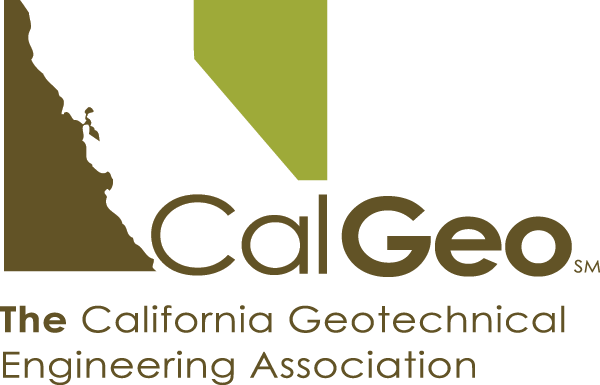 Our name changed to the California Geotechnical Engineers Association in 1987, and was shortened to CalGeo in 2009 – but nothing about CalGeo’s commitment to the business of geotechnical engineering has diminished. The organization continues to make great strides on behalf of the profession and we’ll continue to be the voice of California’s private-practice geotechnical professionals as we advance through the 21st century. 1971 - 1972 Jack Rolston (deceased), Foundation Eng'g Co.
1975 - 1976 Dennis Evans, D.A. Evans, Inc.
1977 - 1978 Thomas Wallace, Wallace-Kuhl & Associates, Inc.
1979 - 1980 Michael Mahoney, Kleinfelder, Inc.
1980 - 1981 Shelly Prager (deceased), Fugro West, Inc.
1982 - 1983 James E. Likins, Geocon, Inc.
1984 - 1985 Dugald R. Campbell, Agra Earth & Environmental, Inc.
1988 - 1989 Cyril M. "Bud" McRae, Kleinfelder, Inc.
1989 - 1990 William E. Ellis, Shepardson Engineering Associates, Inc.
1990 - 1991 David L. Pearson, Agra Earth & Environmental, Inc.
1993 - 1994 Gerald J. Salontai, Kleinfelder, Inc.
1994 - 1995 Barry R. Bevier, Group Delta Consultants, Inc.
1997 - 1998 Michael V. Smith, Earth Systems, Inc.
1998 - 1999 Henry F. Kling, Zeiser Kling Consultants, Inc.
2000 - 2001 Gary C. Masterman, Professional Geotechnical Consultants, Inc.
2003 - 2004 Edward F. Hill, Geotechnologies, Inc.
2004 - 2005 E. David Colbaugh, Evans, Colbaugh & Associates, Inc.
2005 - 2006 Michael J. Miller, Stoney-Miller Consultants, Inc.
2006 - 2007 Gale Paddock, Kleinfelder, Inc.
2007 - 2008 Craig Hill, Earth Systems, Inc.
2010 - 2011 Siamak Jafroudi, Petra Geotechnical, Inc.
2011 - 2012 Rex Upp, Upp Geotechnology, Inc.
2012 - 2013 Todd Kamisky, Mid-Pacific Engineering, Inc.
2013 - 2014 Danny Cohen, J.C. Baldwin Construction Co.
2015 - 2016 Larry Taylor, Taylor Group, Inc.
2016 - 2017 Hannes Richter, Stoney-Miller Consultants, Inc.